Hybrid basis of accounting is the system in which we use both cash basis and accrual basis of accounting. Businessman will record revenues and assets on the cash basis accounting and he will record expenses and liabilities on accrual basis of accounting. In simple words, in this system, we do not record receivable incomes but record all payable expenses. By doing this, this system will become mixed system of accounting which is known as hybrid basis of accounting. This system can also used when your outside income will very low. So, you need not to show any outstanding income but show only outstanding expenses for more deduction out of income tax because by showing outstanding expenses in the profit and loss, your net profit will decrease and its effect on your tax. So, tax will less this financial year. Big companies which works under the law of company 1956 can not use this method of accounting. These companies have to use accrual basis of accounting. One of the main advantages of hybrid basis of accounting, we can use it as provision of all future losses. When we will show outstanding expenses and credit purchases. We are deducting it from our current year revenue. Other side, we need not show any receivable income through credit sale or other sources. So, this method is very suitable for business. Second advantage of this system is to use all the system. So, company or organisation can get the benefits of all methods. 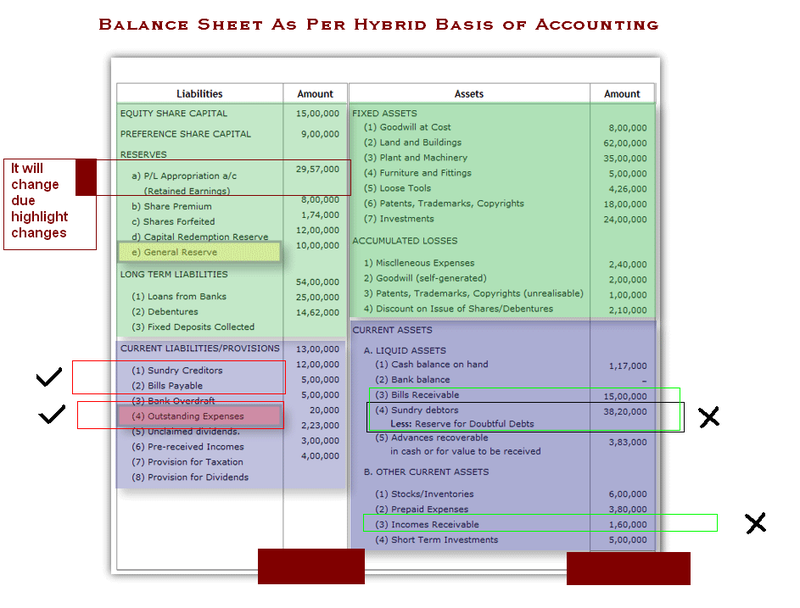 If we have to make balance sheet on the basis of hybrid, it will be following way.